Q: How does it feel to make it into the round of 8 of the winners bracket? A: I am very happy. I am even happier than my next opponent is going to be Curious. Q; What do you mean you are very happy that your next opponent is going to be Curious? A: At least one member of our team is going to be in the round of 4. That makes me very happy. Also, when I first got into Startale, Curious hyung was telling me how bad I was at the game. I hope he'll be prepared to receive my victory ceremonies in the next round. I never forgot how he used to joke at me, and I've been waiting for my time for revenge. Now that the day is finally here, I will practise my guts out. Q: Your games against Alive were really tough. A: I managed to guess his strategy in the first game, but he ended up attacking earlier than I had expected. If I hadn't been able to break through his defences, it'd have been a really tough game. Fortunately I succeeded. In the second game, I chose to play a more passive style based on what my opponent was doing. However, he never attacked and that made me kind of panic. In the end, all the defending led to my economy being so damaged, and I lost the game in the end. The third game went according to how I had predicted it to be. Q: You demonstrated your Terran killing prowess, but there were many dangerous moments. A: I never really lost in PvT during practice. 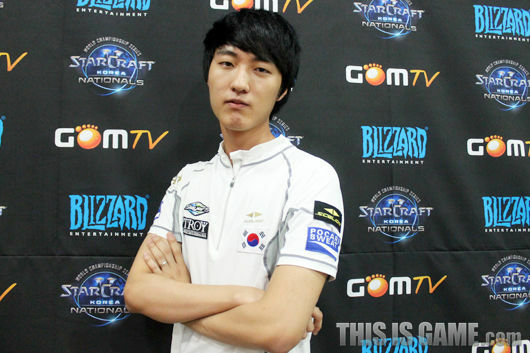 But it's really difficult playing against Alive because his style is different from other Terrans. It just seems like his army movement is just that little bit faster than others. Q: Now that you're in the round of 8, you just need 3 more victories to advance to the finals. A:: Winning today's games gives me more confidence. It feels like I might even be able to win the tournament. There's this sudden confidence that nobody can stop me. I felt that today's games would be the biggest hurdle, and I am very happy to have passed it. Q: The Kespa players have been doing pretty decently in this tournament. A: As professional gamers, they know how best to improve their level in the shortest amount of time. Before this, I already thought that their level of play was really improving very fast, but watching how they've performed in this tournament let me realise that their level is actually about the same as ours. The players in this WCS and SPL are really good. I'm not too sure about their level of play as a whole though. Q: If you manage to defeat Curious, what type of victory ceremony do you have in mind? A: Maybe something like shaking my finger or something. I will make him regret making jokes of me in the past. Q: You're going to be attending the OSL group selections soon too. A: I won't be doing any ceremonies there. I don't intend to provoke anyone in OSL for now. But Baby seemed to have been doing some provocations after he managed to qualify for OSL. It seems like he doesn't know how good my PvT is. No matter what, I hope to be able to be in the same group as him in the round of 16 this time. I want to show him the consequences of making reckless challenges. Q; Any last things to add? A: I want to thank the players who practised with me, Sparta, Harrier, Sound from Startale, Sculp, Hoon from NSHoseo, MentalKing from Team Legion. Hopefully in the match against Curious in the next round, we'll be able to rejoice together no matter who wins. Finally, I want to thank our sponsors, BenQ, Zowie Gear, Joy Gear, Red Bull. Q: How does it feel making it to the round of 8 of the winners' bracket? A: There're many Kespa players in the group, and that makes me stressed. But looking at it from the other side, I am more confident playing because they are around. I am very happy to have advanced. Q: Does the presence of Kespa players really give you more confidence? The games seemed really hard. A: This tournament takes place when our entire team is on a break. I only knew about the change in the schedule while I was out playing. I basically came to play today without having enough sleep, and thus wasn't able to play at my usual standard. Q: Your opponent is Reality, who has been on fire recently. How do you feel after playing with him? A: His fundamentals are really solid, but his assessment of the situations in the game leaves room for improvement. During the early parts of the third game, I was in a really bad situation, but his reaction to the situation was pretty bad too. His TvZ is really good, but his TvP needs some improvement. Q: You used an ancient strategy in game 2, and lost. A: I was not planning to use it before the games. I only knew about this strategy after watching a replay from Squirtle. I learnt the army composition but wasn't really sure about details of the strategy. My opponent defended really well, or maybe I just didn't play well. Q: You made a tremendous comeback after being in a horrible situation in the third game. What were your thoughts after being harassed by the hellions? A: I thought about all the various popular Starcraft websites, and about this appearing in the discussions and the news about it. I was quite dejected. Q: What's the main reason behind the comeback? A: Maybe my opponent overestimated his lead. Even though he was in a lead, he shouldn't have kept on defending. I chose to use a greedy economic style, and was able to make a comeback in the end. Q: How was Yugioh after losing to Reality? A: I haven't dared to speak to him after his games. He was in a really bad shape then. I'm not too sure how he is now. Q: Your opponent in the round of 8 is definitely a Protoss. A: Both Creator and Hero are very good players. I heard that Creator's strength lies in his PvP, and so I hope that Hero will advance. Q: You just need three more victories to advance to the finals. A: Looking at the brackets, I'm going to be playing quite a number of PvPs. It's hard to play in mirror matchups. I'm not even sure what I'm doing when I'm playing in those. It's still too early to be overly optimistic. A: I didn't have much time to practise. I was only practising in the booth. I want to thank the players who practised with me then. I also want to add that I hope Sang from Team 8 will win in SPL. A: I saw Reality lose in his game. It feels like everyone who's left in the tournament are all really strong. I was quite nervous to be the only Kespa player remaining. Very happy to be able to win under these circumstances. Q: You played in the games yesterday too. Is it very stressful to play again in today's games? It's hasn't even been a day yet. A: We were hoping to be able to play the games as late as possible. We wanted to at least have been able to improve a bit more first before having to play again here. I was really worried about today's games. Q: Is it better to have faced Leenock as opposed to MC? 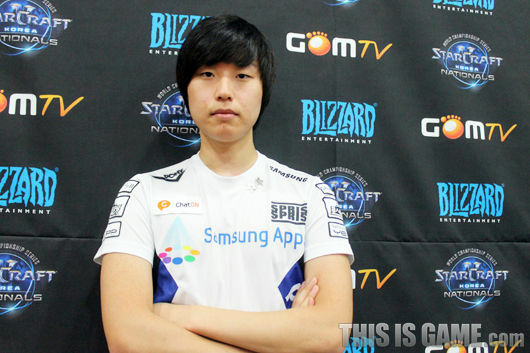 A: I mentioned during the interviews yesterday, I'd prefer to face a Zerg rather than a Protoss. The fact that it was a ZvZ today lessened the stress. Q: You lost in the first game. A: I thought that it'd be a speedling follow up after I held my opponent's first wave of zerglings. Never imagined at all that it'd actually be banelings. It's the first time I've seen this strategy. 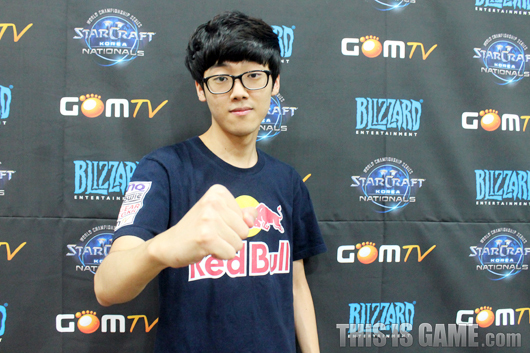 Q: Leenock employed very aggressive play in the second game as well. A: I lost really horribly in the first game, and he really pressured me early in the second game. All that made me feel really uneasy. I usually end up losing after being pressured by my opponent in the early game. I wanted to show everyone my mechanics even if I was going to lose the game. Fortunately, I was at an advantage in the second game due to my opening, and was able to win. Q: You defended his early game tactics very well in the third game. A: My opening was really good. As long as the game went on normally I felt that I would have been able to defeat my opponent using my mechanics. Just thought that it'd be fine as long as I don't make too big a mistake. Q: There's a great difference between ZvZ in Starcraft 1 and Starcraft 2. This is especially the case in the mid-game, where the mechanics are totally different. A: I get really lost when I get to the mid-late game, and so I always chose to end the game before mid-game last time. However, winning against my opponent today made me more confident in my mid-late game. But I feel that I still have to continue working and practising my mechanics, and I do believe that as long as I don't get wrecked by my opponent in the early-game, I would have the chance to defeat my opponent using my mechanics. Q: From the openings, you got into a good position from the start in the second and third game. A: My opponent seemed to have wanted to do early attacks before transitioning to a standard game. I just didn't want to lose in the early game because I wanted people to see my ability in the mid-late game. That's why I chose the most conservative way of playing, and it turned out really good. Q: Your next opponent is either Squirtle or Genius. A: I think that ZvP is the hardest matchup to play now. Since I can't dodge playing against Protoss anymore, I'm just going to have to practise really well in the remaining time I have. Q: Has making it to the round of 8 gained you a lot of attention? A: I've been confident in Starcraft 2 ever since I started playing both games simultaneously. I also achieved pretty decent results in SPL. I am confident in myself, and I'm constantly improving. I didn't dare to say anything much because I lost quite a lot of games in the past, but I think that I can start having confidence in myself now. I believe that I will play even better in the future. Q: The chance of you representing Korea has increased too. Are you hoping to be the Korean representative? A: In the past. I took part in tournaments with the aim to learn. But now, since I've already made it this far, I definitely hope to be the Korean representative in the WCS finals. I want to take it one step further. There're still many strong players around now, and no matter who I meet, I will be able to learn a lot. This is really helpful for me. A: There's the chance that I might face Squirtle in the round of 8. We used to be team mates, hopefully he'll play more gently (laughs). Hopefully the games will not be too one-sided. I will work really hard to make it into the playoffs of SPL. I will also try to win more games in SPL. Yaay Puzzle made it :D I was close to losing all my hair while watching the 3rd game. Puzzle and Roro fighting!!!! Roro my boy, your humility, your talent, and your desire make me a proud fanboy. Advice to others: never put Roro on your anti-team, ever. Instead, be a fan of one of the most hardworking and underrated Zergs ever! "If you don't know where you are going, you can never get lost." Thank youzz for the interviews. If PartinG wins he shouldn't celebrate, he should just go completely stone faced and emotionless and start packing his stuff up, that would be the greatest ceremony he could do. Damn roro is impressive to already be ro8 and beat leenock is very impressive. really impressed by RorO`s play today. To beat Leenock who is usually pretty damn good in zvz is quite good. Might be too subtle to pick up on. Also, I have a suspicion Parting might not be the biggest fan of subtlety when it comes to celebrations. Lol, it seems like every other interview PartinG is really cocky. Like his ro32 interview was quite humble (for parting) but this one he starts talking smack again. So troll. "Life isn't measured by the breaths you take, but by skill in Starcraft"
SK_MC, ST_Parting, STX_Bogus fighting!!! Colossi should shoot nukes and blink.